Citra and Simcoe Hops impart fruity and earthy notes for a new twist on a flavorful friend. This IPA packs a hoppy wallop. Look: It pours golden and clear with a white head. Head retention is very good. Smell: It has aromas of citrus and pine which are quite high. There is also a back ground grainy sweet element. Taste: There flavors are centered around the citrus with some pine in support. There is a low level of floral and slight spiciness with a little git of grainy sweetness. Feel: It has a medium body with medium carbonation. Overall, the hops is this beer are quite intense and work well together. I remember being blown away by this a number of years ago, like, completely floored. ive since changed my mind, as my palate has evolved, my tastes have matured, and ive had about a million big ipas. this one seems a little less complete than it used to, but it was ahead of its time, and deserves credit for that. it pours a light straw color, mostly clear, with a huge fluffy white head with good lacing and retention. the nose is really bitter, with a pine complex. the flavor is balanced by some light pale malts which give the faintest hint of sweetness, and the bitterness takes on a lovely fruity character towards the finish. the swallow is a little hot from the alcohol, which is exacerbated by the thin body. ive come to expect a little more meat on the bones of these beers, but this one is fairly thin. the carbonation is nice though, and almost makes the bitterness sting in the aftertaste. overall a little weak on body and a little more intensely alcoholic than necessary, but a delicious beer that I can credit with turning me onto the genre way back when. poured a medium golden with some reddish hints, mine had little head and I was at a place where I would expect good glass. Carbonation was minimal. Aroma was citrusy and spicy, reminding me of SN Celebration. This was more piney than citrusy overwhelmingly. It finished really dry and was all hop, no malt complexity. Mouthfeel was full (from a wallop of hops) to dry. This is a good beer but I think there comes a point when too much is too much. Pours a clear golden hue with a terrific looking large, white head and lots of lacing. Grapefruit aroma along with loads of hops. The taste is sweet and hoppy. Little malt flavor, but plenty of hops. Bitter finish. Medium to full mouthfeel. Oily feeling in the mouth. High level of carbonation. At 8.5%, the alcohol is very noticable. Flavorful, but not complex. A good choice if you love hops. Appearance - Pours a crystal clear gold color with a two-finger head that disappears slowly and leaves outstanding lacing. Smell - Yowza!! Big-time floral and grapefruit hop aroma. There are some hints of fruit (orange, tangerine, etc...) as well. Taste - A slight malt sweetness at the beginning, but don't blink because you will miss it. After this hint of malt the rest of the flavor is straight up hops baby. The hops stick around long after the last swallow too. There was little to no alcohol taste noticeable in this brew. Mouthfeel - Medium and sticky with good carbonation. Overall - If you're used to a DIPA with more of a malt backbone, I'd look elsewhere. 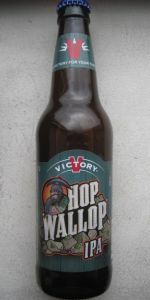 Hop Wallop is a full on assault on your taste buds and it shows no mercy. Beware, because this brew grows on you very quickly and the alcohol may catch up to you. The drinkablilty is only limited by how much hop and alcohol tolerance you have. Well done Victory. Pours a semi cloudy straw yellow with a small frothy head fed by intense carbonation. Good lacing. Smells of juicy citrus hops backed by a good dose of light malts. Intense hoppiness right away upon first sip and throughout for that matter. Light mouth feel that tingles the tongue for quite a while. Bready malts peak out from the back. Good hoppy finish. Hides the 8.5% well. Impessed. Bought a six-pack recently. Appearance is a clear copper color with some patchy lacing and a thin head. Aromas are indeed a wallop: spiced, fruity hops, hops and more hops. Excellent, grassy smell; very strong and awesome. Taste follows the aromas, but it is surprisingly well-balanced with a bittersweet aftertaste mixed in with the supreme amount of hops. Good mouthfeel, crisp and carbonated but supplemented by a smooth body, almost lightly creamy. Probably one of the strongest but most balanced IPA I have had in awhile. Excellent. Had this on draught last night, in an 11 oz glass, and while it was indeed delicious, it didn't pack the hop wallop I was expecting. This would be a dangerous session beer, as it is highly drinkable, but the mellow hops hide the 8.5% alcohol! Appearance was a nice & hazy golden yellow, and it left behind quite a bit of lacing as the beer magically disappeared. I thought it had a strong hops scent, but the taste was quite a different story. The bite I was expecting was replaced by a mellowness, and a smoothness, that really allowed me to hhold the beer in my mouth to really savor and enjoy the fine taste. Overall an execellent beer. Highly drinkable. Would definitely drink it again. Really a nice bitter finish...relatively complex....interesting for sure...I'd enjoy a six pack of this every year but would chose the west coast offerings over this if push came to shove. Appearance: Pours a golden hue with a nice 1" densely foamed white head. Decent head retention and ample lacing line the pint glass. Smell: Loads of citrusy hops and pine like scents. Hints of fresh cut grass, herbacious. Taste: Hops, Hops and more Hops. Begins somewhat mellow, sweet and herbal then transitions to a big time, grapefruity hop bomb. Very long, bitter, dry finish. No hints of alcohol but I feel its warmth. Mouthfeel: Somewhat slick and oily, plenty of carbonation. Drinkability: This is one of the seasonals that I can't wait for from Victory. If big, juicy, citrusy hops are your thing then Hop Wallop is a must try. I could definitely drink a few of these, but its not a session beer by any means and if you plan on having anothe style of beer after a few Hop Wallops, think twice. A few of these could wreak havoc on some taste buds. Overall, a fantastic, big, hoppy DIPA that is a must try. Glad that its readily available in my area. Seek and enjoy. Poured from the bottle into a standard pint glass. The Wallop appears an opaque golden color with a fat, bubbley two-finger head on top. Kinda looks like a Belgian white due to the cloudy nature of it. The head eventually settles, leaving a thick ring of intricate lace all around the glass. Very cool. The bouquet is hoppy and strong. I don't know what kind of hops are used in this beer, but it honestly smells like marijuna. Not joking. It has that sticky cannibas scent to it. But it's hoppier, with some citrus and some pine. What a great aroma. I should've poured this into a snifter to really capture everything. Taste is sweet up front, with malty notes of lemon, pineapple, and pear. The middle begins to shift into a tangy bitterness. And the finish is stong, hoppy, and bitter. Leaves a heavy bitter aftertaste. Man, I really like this beer. Very drinkable for such a potent IPA. You can tell that there's some alcohol here, but it's not overwhelming at all. It's more subdued by the strong bitter finish. Smooth, creamy mouthfeel. Another very nice beer by the folks at Victory. 12 oz bottle into imperial pint glass. S - Some hops on the nose, especially right off the pour, but malty sweetness takes over after head dissipates. T & M - Very interesting. Victory's website doesn't say what hops are used in this beer, but that pils color I indicate above may be indicative, as to me, this tastes like a very strong European pils (Urquell? ), particularly on the finish. There is a substantive amount of malt here of course, but b/c of lack of roasted malts (explaining the lighter color) the malt *flavor* is less prominent than in other Imperial IPAs I've had, and the hops more prominent. Alcohol raises its end only at the very end of the palate, especially after warming up. Dry hoppiness lingers on the tongue for a *long* time. Carbonation is right on for the style - nice and low. D - Very. 'Nuff said. This is a great effort from Victory, who usually makes a great product. Poured a light golden honey color with a dense two finger head. Smells good lots of piney citrusy hops and I also detect a slight sweet maltiness as well. Tast very similar to the smell. LOTS of delicious hops with a slighty bitter aftertaste when its hits the back of tongue. All in all a great example of the style enjoying it immensely. Alcohol is well hidden in this hefty brew. Pours from the bottle a hazy, golden-yellow color, with a good white head. Nice floral aromas, grassy hops and grapefruit. Not much of a DIPA on the palate, with a bunch of citrusy hops (grapefruit, lemon) running rampant over a malt backbone which is much more like that of an IPA. A very good beer, but not malty or alcoholic enough to be a true DIPA.